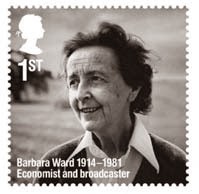 Royal Mail has announced a special slogan postmark to be used to mark the birth centenary of Barbara Ward, the economist who featured on a Remarkable Lives stamp earlier this year. Barbara Mary Ward (23 May 1914 – 31 May 1981), later Baroness Jackson of Lodsworth, was a British economist and writer interested in the problems of developing countries. She urged Western governments to share their prosperity with the rest of the world and in the 1960s turned her attention to environmental questions as well. She was an early advocate of sustainable development before this term became familiar and was well known as a journalist, lecturer and broadcaster. Ward was adviser to policy-makers in the UK, United States and elsewhere. The postmark is in use from today for a week from some mail centres* on mail delivered to parts of the YO (York) postcode area.